Name: What is your name…? Found You: How did you find this website…? Location: Where are you from…? Message: Darron did a very good job, he laid laminate flooring, replaced skirting boards and installed a bespoke wardrobe, all this was done to a high standard and I would definitely recommend him. Message: I have used Darron and his Mastercraft company extensively as subcontractors to my Architectural practice. He is the first guy I call when I have a project on. His work ethic is outstanding and the standard of finish exceptional. I have no hesitation in recommending him, he is a rare gem!! Message: I can highly recommend Darron. He was the key contractor in the construction of a kitchen extension and the quality of his work was outstanding. As important, he turned up on time, managed costs accurately and always left the site tidy. He took a lead role in acting as de facto site manager and in truth the project would not have succeeded to the standard without his invaluable help. Darron is a hugely skilled and highly trustworthy artisan, a rare commodity in the market place. I can highly recommend him. Message: I cannot praise Darron highly enough, fine craftsman, punctual, did the job quickly, calmly, incredibly professionally and very reasonably! I would not hesitate to recommend him to anyone. Wish he was a plumber and electrician too so he could bring his high standards to bear elsewhere! Message: Darren did a really great job for us, we are really pleased with the finished result. We had an integrated TV unit and some shelves built in our lounge along with quite a few other minor jobs. All of these were great and Darren was very pleasant to deal with, tidy and polite. Highly recommended, thanks very much. Message: we were trilled with the quality and commitment of the work that mastercraft did for us in our newly renovated house we would highly recommend their services and look forward to using them again in the future. Message: Darron did some carpentry work for us. As written by others the work was excellent, on time and to budget. We will certainly use him again and are happy to recommend him. Message: We are delighted with the fitted shelving that Darron has made and installed. His prices are realistic, workmanship excellent. He is a credit to his profession! We would heartily recommend Mastercraft-carpentry. Message: Darron Relf of mastercraft ,was instrumental in the comprehensive renovation of our family home in south west london over a period of 10 months.He was responisble for most of the extensive carpentry work in the house,as well as the day to day running of the job.He was able to build fitted wardrobes,bedroom storage,radiator covers,bathroom cabinets,and a library of bookshelvers as well as tailoring skirtings,architraves and doors.Darrons knowledge and expertise were invaluable to us throughout the project,along with his wide experience of the building industry.He was able to offer practical solutions and design suggestions and displayed endles patience and dilligence in achieving the highest standards.He obviously takes great pride in his work and was a pleasure to work with.we wish him and mastercraft continued success.Best of british! Message: I recently employed Darron from Mastercraft to work in my home. I would recommend him without reservation. Not only did he do an excellent job, he was also prompt,polite,professional and tidy. Message: Darron has worked for me personally and on behalf of clients. Darron has always provided an honest days work with due consideration for the home in which he works. We were very pleased with the quote for some cupboards under the stairs,darron did a fantastic job,the results went beyond our expectations & with his creativity he transformed the space into useable storage with a professional finish,not only was it a quality job but darron did it with no fuss ,professionally and everything was left clean & tidy. 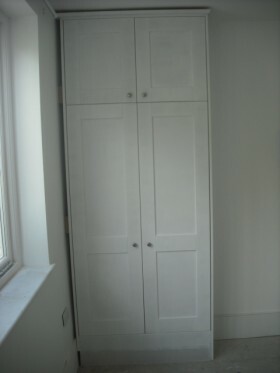 Darron installed some bespoke fitted wardrobes which has transformed our bedroom. The quality of his craftsmanship is excellent and was exceptional good value for money. The end result has exceeded all our expectations, Darron was able to design and build something that was exactly what we wanted, even incorporating a make-up drawer for all those ladies essentials. He worked solidly for the whole time he was here and was pleasant to have around. We will definitely be using Darron again for any future carpentry work and would highly recommend him to others.